Kinshasa 27-08-2018 Health - These two people are among the first ten patients to have received the therapeutic molecule mAb 114, developed by a Congolese, Professor Jean-Jacques Muyembe. 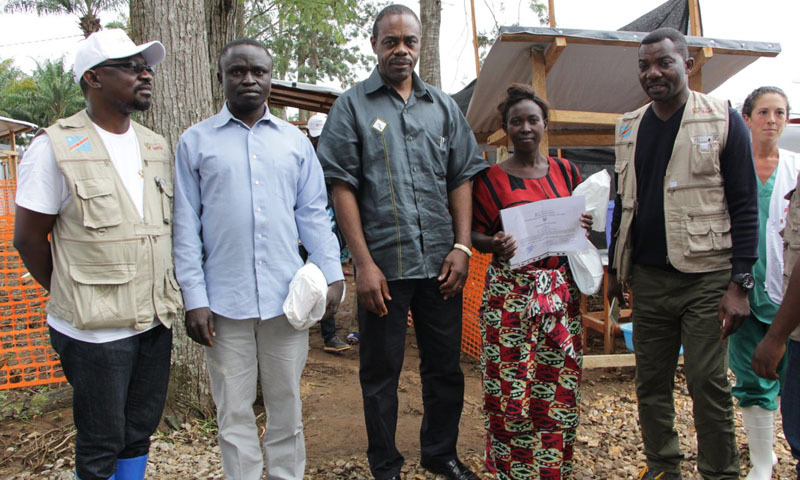 Health Minister Oly Ilunga Kalenga attended the hospital discharge of two cured patients at the Mangina Ebola Treatment Center (ETC), CPA learnt from on Saturday from epidemic of Ebola virus disease in Nord-Kivu. According to the source, these two people are among the first ten patients to have received the therapeutic molecule mAb 114, developed by a Congolese, Professor Jean-Jacques Muyembe and the National Institute of Health (NIH) from the serum of a survivor of 1995 Ebola outbreak in Kikwit. The short, medium and long-term observations of patients and survivors will allow evaluating the extent to which the molecule has contributed to their recovery, the source added. The Minister of Health delivered 13 motorcycles and one ambulance to the Makeke Health Zone Response Team located in the Mandima Health Zone in Ituri Province. He also visited the place where the CTE of the Makeke village will be erected. The source reports that Dr. Oly Ilunga Kalenga has brought together the leaders of neighborhoods and avenues in Mangina and later the customary chiefs in Beni to engage in the activities of the response.